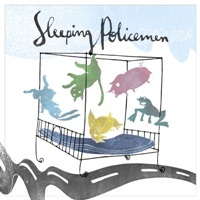 Sleeping Policemen's gentle, elegant indie pop comes tumbling out of your speakers, lands in a crumpled heap on your floor, and after a quick glance around, opens the curtains to let a bit of sun in. As home invasions go, it's a pretty welcome one. curtains to let a bit of sun in. As home invasions go, it's a pretty welcome one. and love and all that. Like their traffic safety namesake, they'd like you to perhaps slow down a little bit. twist instead of by wrecking your suspension is something to be thankful for.